For my son Aiden’s 7th birtday, I attempted frozen buttercream transfer. The cake was a hit! It definitely had great visual impact! (I think the stars helped!). There were mistakes, and I’ve learned a lot since! But each cake is an opportunity to learn and improve! If you haven’t heard of frozen buttercream transfer, it’s when you pipe the top of the cake before the cake is even baked! You use parchment paper or wax paper, and trace an inverted image with buttercream. You colour it all in by piping with buttercream, not leaving any spaces. Then you freeze it, and when you’re ready, flip it on to the cake! Here’s a link to my step by step progress pics for a Led Zeppelin cake that I did with Frozen Buttercream Transfer! Below is the picture of my first ever FBT Cake! Aiden’s FBT Mario Cake! There are no progress pics on this cake. It took quite a long time to colour each batch of buttercream before colouring in the next part of the picture. But I’d say the best part of this technique is that you can do it ahead of time! Once you’ve done your colouring, you need to freeze it, and you can freeze it a week ahead of time! And the stars! They’re done by the royal icing flooding technique, (tutorial to come soon!). And they need 48 hours to dry, so again, they can be done ahead of time! I ended up using the piping swirl technique on the side of the cake. I put both blue and white icing in the bag at the same time. This was to try and create a “cloud like” effect. It was a warm day, and the buttercream got a bit too soft. but overall I think the effect was success! I especially like the tiny star accents I created. It’s in the little details! Since this cake, I have learned how to “mush” together the colouring lines. I use papertowel! There are some brands out there that do not have much of a pattern! Such as Viva Towels. I lay it lightly on the buttercream and use a smoother on the papertowel to smooth the buttercream below. But it does leave a slight doppled effect. 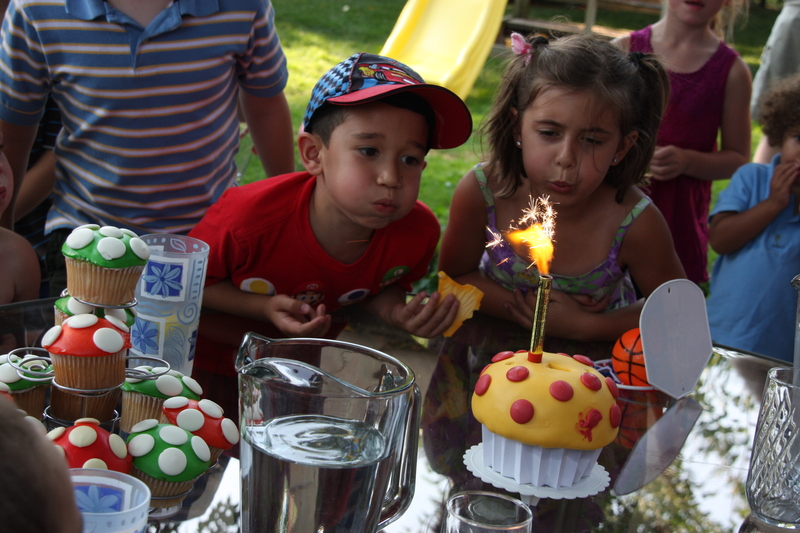 You may be wondering… I posted Aiden’s first, second, third, and fourth birthday cakes, where are five and six? 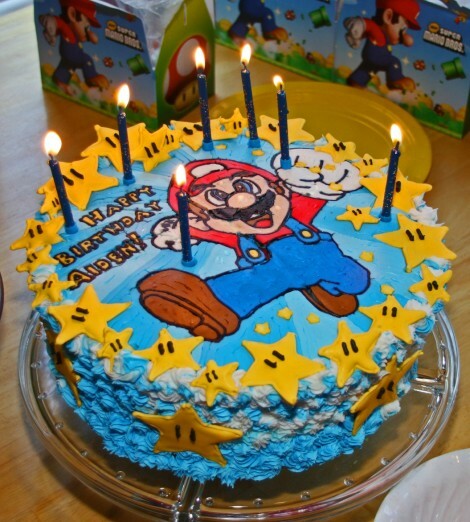 I had no great pictures of his fifth and sixth birthday cakes, but because his cake for his sixth birthday was also Mario themed, I thought I’d tag some of the birthday party pictures to help share ideas, in case you found my post because you were looking for Mario Party ideas! There was no good picture taken of the cake. 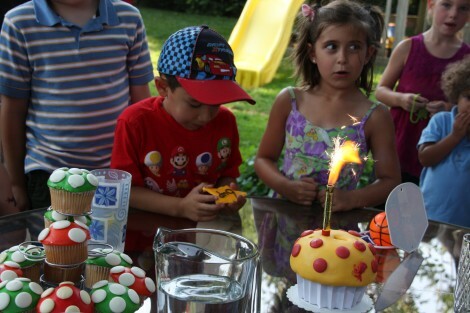 It was one giant mushroom cake, with a beautiful large royal icing “6 up” star perched on top. (I’ve just been corrected by my son over my shoulder… it is not just a mushroom… it is a Mega Mushroom!) I also made up individual mushroom cupcakes and I displayed them on a cupcake stand. In the picture below you can see the candle lit, and the “six up star” in Aiden’s hand, already with a bite out of it! Also are the mushroom cupcakes on the bottom left… with a couple of cupcakes taken already! That sparkler candle doesn’t blow out! It burns out on its own. That didn’t stop the kids from trying though! I had some great ideas for economical party favours to go in the Party Loot bags! 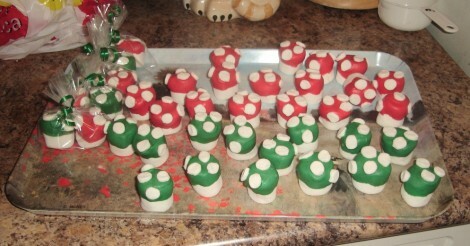 One was marshmallows dipped in chocolate to create mini mushrooms! They looked so cute as a pair in a little plastic bag! I used regular sized marshmallows to dip, and mini marshmallows sliced for the dots! In the pic below was a trayful, with a few pairs started on the left of the tray. Each loot bag had a pair. Kids LOVE chocolate dipped marshmallows! 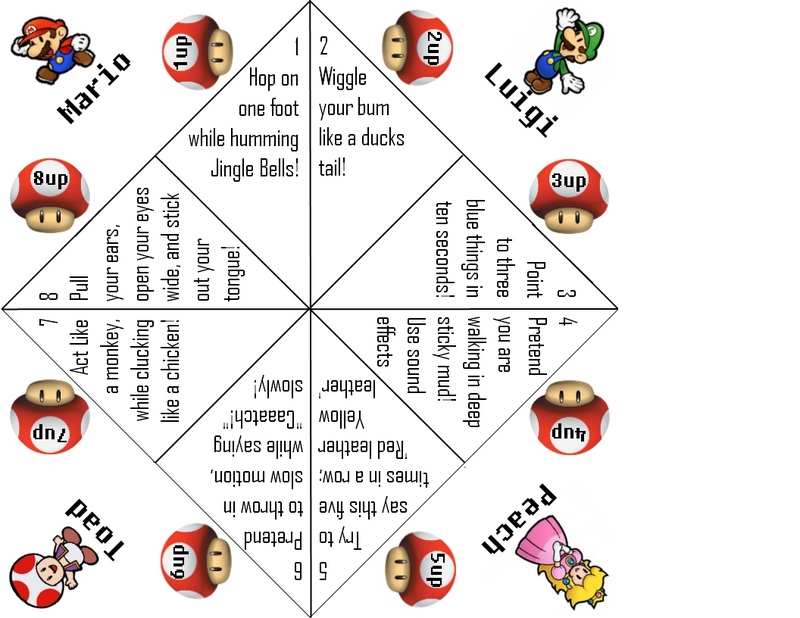 One was a special ‘cootie catcher’ Mario game! So I thought to share it on my blog in case someone else can use it for their party favour bags! Simply click on the picture below to open it in a new window (at a larger size, 8 1/2 by 11), and then right click and save the larger image from that window! 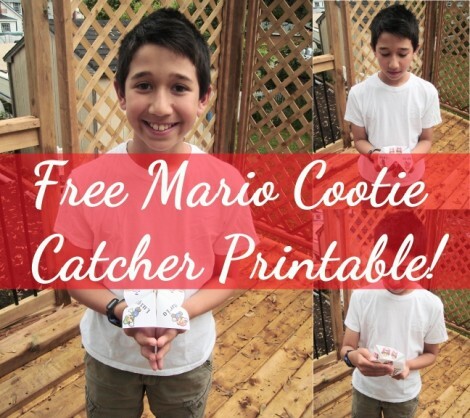 We printed it on card stock. You’ll need to cut it to a square before folding. 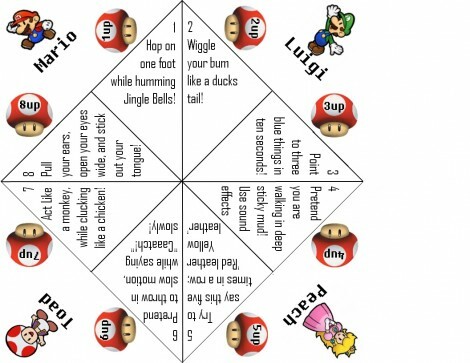 Do you remember how to fold a cootie catcher! Comment if you need a reminder! 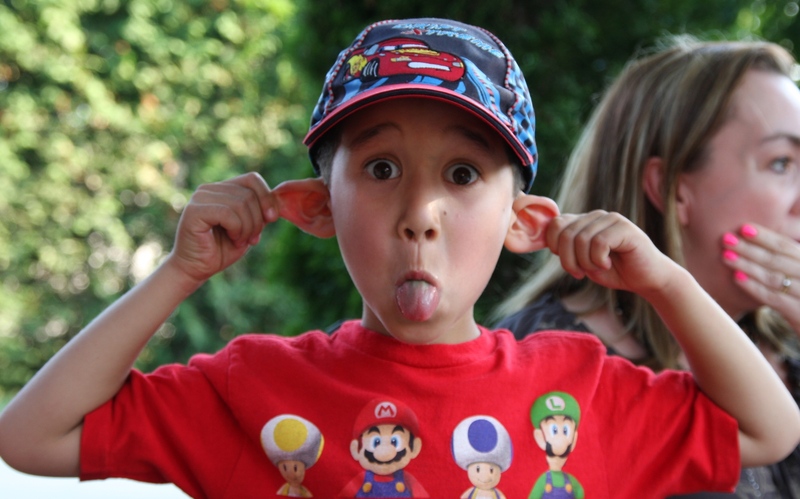 You’ll note that #8 tells you to “Pull your ears, open your eyes wide, and stick out your tongue!” Below is a shot of my 6 year old doing as he’s told! 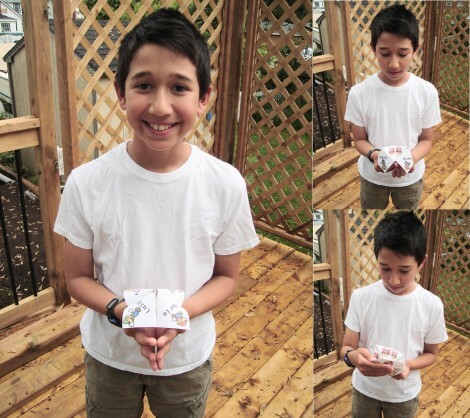 And below is a pic of my now 10 year old son showing the cootie catcher in action for my blog post! ← If at first you don’t succeed… try again next birthday! My Thomas the Tank Engine cake story.